Check out this slideshow with not 5 but 10 reasons! And if you need even more reasons, there are even more to learn about (!). Enterprise localization and deploying materials across multiple regions is complex. You need a translation solution that is simple, scalable, and robust. Wordbee translation management system (TMS) will help you deliver your content, localized into multiple languages faster and more cost-effectively, even across multiple departments and millions of words. Wordbee has incredibly detailed enterprise localization solutions and customer support for organizations of every industry, and has brought localization to where it is today: enterprises can reliably produce, manage, and localize large quantities of content with respectable efficiency, no matter the highly specific challenges of content, format, or objective. Wordbee also can help you by taking full control over your enterprise localization processes, creating crystal clear KPIs for your stakeholders or teams, and having a project manager that ensures configuration and execution are in the right place to achieve the highest results for your translation and localization processes. In this article we’ve got 5 reasons why Wordbee Translator is the best solution for your enterprise localization needs. Automate every aspect of your translation projects, including workflow application, staffing, assignments, job kickoffs, deliveries, invoicing, and more. Custom automation. Automation for your automation. Wordbee’s comprehensive and automated system guarantees you the fastest turnaround times in the business. Reduce your project management costs by half and watch kickoffs happen without delay with the help of the would-be translator project automation project system. 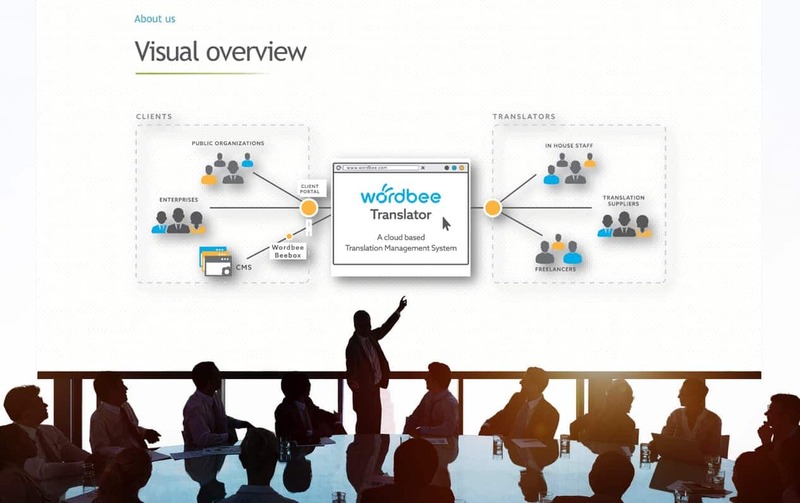 Connect all your content streams, corporate websites, digital asset management systems, content management systems, departments and their documents, documentation systems… to your world-class translation management system with Wordbee. Our connectors include Adobe AEM, Sitecore, WordPress, Drupal, Microsoft Sharepoint, Kentico, and more. You can check our dedicated connector page for more details here. Get rid of the need to have several localized digital content streams. Wordbee Translator can help you with financial management and every KPI report your enterprise localization team needs to make critical decisions to improve your localization processes. Wordbee goes beyond project management with integrated translation memory and powerful tools like global search, auto-propagation, text archives, integrated terminology databases, MT engines, dictionaries, and several import/export formats. Your team shares the linguistic resources as they work, and you save time and money with fully integrated linguistic tools, rather than linked deployments. The list goes on. If you need more details and benefits why you should choose Wordbee, visit our dedicated Enterprise page or check our past webinars to see the tool in motion.